As we continue to enjoy this pleasant, dry weather, it’s difficult to realize that December is less than two weeks away. At this point it seems like we’re getting spoiled in late November with high temperatures in the mid- to upper 50’s; indeed, the forecast for this Saturday calls for a high of 55 degrees Fahrenheit and lots of sun. Over the next ten days it looks like highs are going to hover between the 40’s and low 50’s, but lows could be below freezing and we might even get some snow (which we haven’t seen since mid-October!). Walking through the arboretum, it’s difficult to miss the many conifers planted across the grounds. On a closer inspection, one notices that many of these trees are full of cones. It appears that this year was another good year for cone production in southern Minnesota for pines, spruces, and firs. 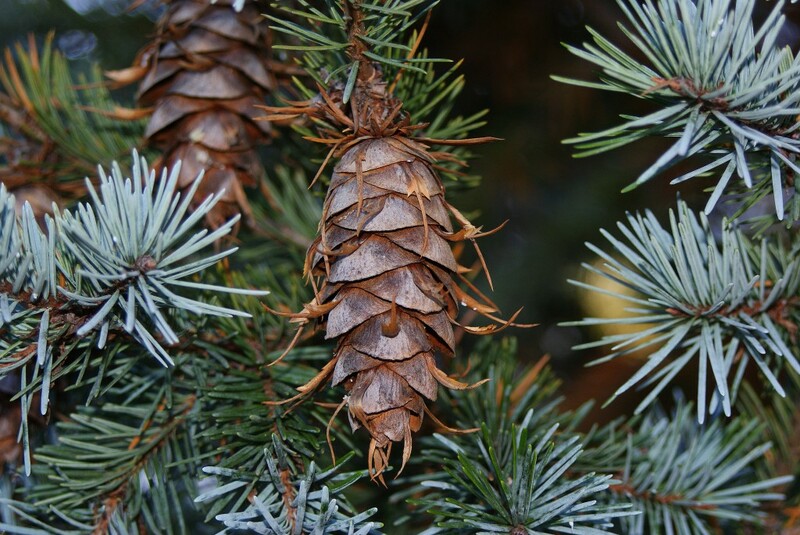 Last year saw a bumper crop of spruce cones, particularly that of the white spruce (Picea glauca), which attracted flocks of White-winged Crossbills on their once-every-two-decades-or-so irruption into southern Minnesota. While we may not see the crossbills again for a while, it will be interesting to see what wildlife is attracted to this year’s bounty. Douglas Fir cones in conifer garden southwest of Interpretive Center, 11/17/09. – Pileated Woodpecker seen flying over Arb on 11/17 and heard “clucking” from large trees near President’s House on 11/19: these are the first sightings of our largest woodpecker on campus since before the tornado in 1998! **Due to the Thanksgiving holiday, the next scheduled update of “Arb Sightings” is Thursday, Dec. 3.